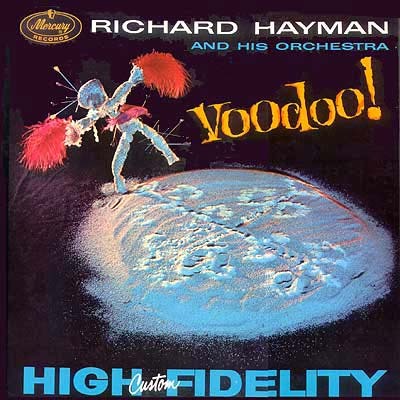 Cover Art: Richard Hayman - Voodoo! Notes: A bit of late 50's/early 60's exotica here for your listening pleasure. 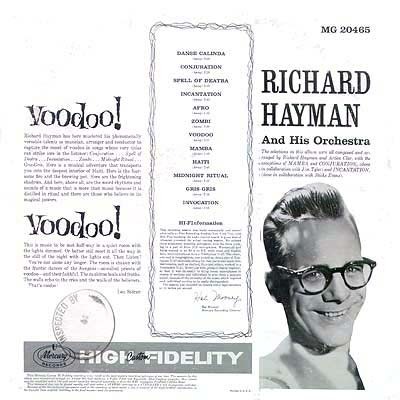 The liner notes are very strong on the technical setup and make/model of the microphones and mastering equipment, but don't mention any players beyond Mr. Hayman. The cover photo speaks for itself very well I think. Let me quote from the cover notes, "This is music to be met half-way in a quiet room with the lights dimmed. Or better still meet it all the way in the still of the night with the lights out. Then listen! ...That's Voodoo! A very nice find for your mental bachelor pad.